Also, let me repeat that understanding this court case will require reading the court documents and taking time to reflect. I have done the best I can to make the principles involved clear and as accessible as possible, but there is only so much that can be done in a case study like this to guide readers through material that is this dense with detail. Hopefully the format of presenting facts and then (often) analysis and commentary is of help. Note: The following sections share some of the pre-history of the lawsuit, as written by Julie Anne Smith in her BGBC Survivors blog. Additional materials may be added at a later time to address additional aspects of the period leading up to the BGBC defamation lawsuit. This blog has been set up primarily as a safe haven for those who suffered at the hands of the pastor and/or members (perhaps unknowingly) of Beaverton Grace Bible Church. If you would like me to post your story, please send to: bgbcsurvivors@gmail.com Because of the nature of this situation, I understand that some will want to remain anonymous and I fully respect that choice. As I have gone through this process personally and have read books, scoured the internet for understanding of what we went through, I am aware that others who may not have gone to BGBC will venture upon the site. You may read something here that sounds very similar to your church experience, just as I did on other blogs/websites. You are free to comment and respond, too. Sadly, this is not an isolated church experience and my heart goes out to you, too! You are not alone. When you post anonymously on my Blogger blog, I am unable to see any identifiable information (ISP addresses, etc), so please know that this is a safe place to share your story or comment. If you have ideas for discussion, please send them along to: bgbcsurvivors@gmail.com. Somehow, the powers that be at Google have removed my legitimate reviews of Beaverton Grace Bible Church, yet have allowed Chuck O’Neal’s reviews of me on the Google review site of the church. 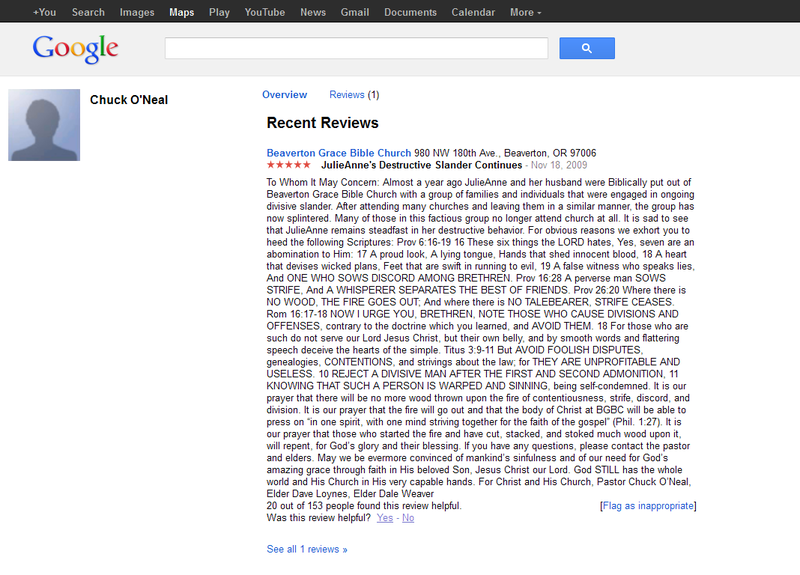 I wasn’t aware that if you search Beaverton Grace Bible Church on Google, that my name was up for review. I thought the Google Review forum is to review the site, not reviewers. How can a man yield that much power to convince Google to remove posts and let his reviews stay when they do not even constitute as reviews? He has two reviews of me posted – both with 5 stars. Before he changes, them, I want to post them here and then will address a number of issues. Interestingly, within 2 hours of publishing the first post on this blog, Chuck revised an earlier review and had this threat for me and “many of those involved” in a threatened defamation lawsuit. Defamation is based on false accusations. He will have a hard time in court proving that my words are defaming. I wouldn’t waste my time on defamation – what is there to gain in that? I will, however, sacrifice my time and energy in speaking the truth when there is abuse of power going on and lives are at risk. DEFAMATION IS A CRIME: Pastor Chuck O’ Neal, his wife, his children, and Beaverton Grace Bible Church as a whole, have suffered JulieAnne’s hateful lying slander for well over three years. After seeking counsel from a pastor on staff with Grace Community Church (under Pastor John MacArthur) and reading him several excerpts from JulieAnne’s endless defamation, he recommended that we FILE A LAWSUIT in an appeal to Caesar as the Apostle Paul did when falsely accused of crimes against God and the state. The lawsuit has been filed in the Washington County courthouse. JulieAnne and many of those involved in her present and historic slander will be served within the week. Her many lies and vicious criminal accusations will not stand in the light of day in the Washington County courthouse or in the coming courtroom before God. OVER THREE YEARS AGO the reviewer known as JulieAnne or “BROWN” was Biblically put out of Beaverton Grace Bible Church for ongoing vicious slander. You can see my 2009 response to her in the reviews below . NOTE: The following screenshot of Mr. O’Neal’s Google Review of November 18, 2009, has been added here for the BGBC Defamation Lawsuit Archive, to illustrate the above text from Julie Anne’s blog post. You can compare/contrast this version with the typed text above to see if there has been editing. Click on the image below to link to a larger version that is more readable. The actual lawsuit events started with the filing of the original eight-page Complaint on February 22, 2012, charging defamation and asking for damages of $500,000. In addition, the Complaint also states that “Plaintiffs intend to file a motion seeking permission to allege a claim for punitive damages” (page 6). The original Complaint that started the lawsuit process contained 17 allegations of defamation against four defendants. Here are the defendants, in the order cited in the Complaint. Julie Anne Smith (11 allegations). Jason Stephens – son of Kathy Stephens (two allegations). Hannah Smith – daughter of Julie Anne Smith (one allegation). Later changes would involve dropping two of the defendants – Jason and Kathy Stephens – and adding another defendant –Meaghan Varela. A failure by the defendants to respond by their deadline to the O’Neal/BGBC Complaint would have meant automatic default and loss of the lawsuit for them, and thus incur liability to pay the full amount of damages asked, half a million dollars. Understandably, all four decided to seek for legal representation. They began their search. When news of the lawsuit filtered into the broader Christian community, theological questions naturally arose about the legitimacy of filing a civil suit instead of settling it within the church, either through a process of communication, church discipline, mediation, etc., as appropriate to the situation. As claimed in Mr. O’Neal’s Google Review of February 25, 2012 (see text in above section), supposed church discipline did not settle the matter, as far as he was concerned. Also, as best I can tell from my research, there were several points along the way when appeals were made to Mr. O’Neal for outside mediation or to otherwise resolve things without this civil suit. This included representatives from Grace Community Church (GCC; led by John MacArthur). As we will see shortly, GCC employees spoke with Mr. O’Neal when he attended their annual Shepherds’ Conference in March 2012 and offered to mediate. However, he declined and insisted on having his day in court. In various of Mr. O’Neal’s online comments in various places in 2012-2013, he seems to have seen a civil suit as the only remaining option. This was because of Ms. Smith’s online comments and messages, her later blogging (which began on February 24, 2012, at a time when she did not even know yet about the lawsuit), and his ongoing charges that she was defaming him and BGBC. Apparently, for Mr. O’Neal, there was no letting go of the alleged offenses, of settling out of court through mediation, or of withdrawing the lawsuit. Whether that will ever happen is anyone’s guess. I suspect the Varelas (and Julie Anne Smith, for that matter) would not be able to change sufficiently for the standards of Mr. O’Neal. But, theologically speaking, I am uncertain where the Bible mandates that we hold on to alleged offenses against us by others, not letting go of them until THEY change. Certainly that does not seem to be consistent at all with the way of Jesus, who forgave even those who brutalized Him. Despite the theological issues involved here, for now it will be the legal issues that set the framework for the rest of this narrative account – which is, as a reminder, purposely written with a bias toward the defendants’ point of view although it uses the plaintiffs’ documents as the framework for exploration and analysis. On March 12, Julie Anne and Hannah Smith hired Linda K. Williams of Portland, Oregon, as their representative to respond to the lawsuit. Around that same time early in March, Kathy and Jason Stephens hired Herbert G. Grey of Beaverton, Oregon, as their attorney. They began preparing their declarations and responses for the court. The defendants’ attorneys filed these responses and also, Ms. Williams filed an anti-SLAPP motion on all the defendants’ behalf on April 26. SLAPP stands for Strategic Lawsuit Against Public Participation. These are civil suits whose purposes are generally designed to silence or intimidate opponents. SLAPP suits are often frivolous and insidious, used by individuals or entities with “deep pockets” – ample funds to outlast and outlawyer their opponents. How does an anti-SLAPP work? As best I can understand and explain it in relatively non-technical language, the filing of an anti-SLAPP motion “freezes” or “suspends” the judicial process. So, the case does not go to a jury trial (as was requested in the O’Neal/BGBC lawsuit). Instead, the case goes before a judge and is given expedited treatment. If the plaintiffs demonstrate their case clearly enough and the anti-SLAPP motion fails, the defendants could appeal. If the defendants’ appeal fails, then the lawsuit goes forward with discovery, depositions, jury trial if requested, and cross-examination. If the anti-SLAPP motion succeeds because the plaintiffs fail to give substantial enough evidence, then the lawsuit is over (unless the plaintiffs appeal). So – since plaintiffs hold the responsibility to give “substantial evidence” that their allegations of the defendants’ statements indeed constitute “defamation,” the key implication in the Beaverton Grace Bible Church v. Smith is this: Once the anti-SLAPP motion went into effect, the plaintiffs and their legal counsels were pretty much stuck with working within what evidence they had already submitted. There are indicators from sources other than my opinion that the plaintiffs’ documents were poorly drafted, and done without consideration that an anti-SLAPP motion might be filed. (See some points from Ms. Williams’ perspective noted in the section below on “Before Going Farther #2.”) And all of this seemed to set the plaintiffs’ team off in an almost unrecoverable direction, right from the start. Ms. Williams suggested there were other such moves by the plaintiffs that would eventually lead to their paying far higher costs in the award amounts. Those are detailed below, in the subsection on “Before Going Farther #2” (on problems with documentation and presentation), and in the Analysis/Commentary section following the entry for September 3 on Deadline to Contest Statement Details. There are several very helpful resources for defining and interpreting the legal principles and precedents most relevant to the case of Beaverton Grace Bible Church v. Smith. I have already referred to the general assistance that the Citizen Media Law Project offers, and their links to the core six court documents. The official court documents offer us a very important source for comprehending the many complex issues raised in this case, and for grasping its significance. Attorney Linda K. Williams in particular has done us all an immense service by using the defendants’ court Memorandum documents to educate us on relevant legal issues. She provides definitions of core concepts, and describes the history of U.S. case law for how we come by these principles. She lays out relevant U.S. and Oregon statutes, and shows how they should guide the legal reasoning as applied to the BGBC defamation lawsuit. And she writes as much of this as possible in language accessible to both laypeople and lawyers. So, she has created a crucial resource, as these kinds of defamation lawsuits are not particularly common, especially those involving individuals and organizations dealing with religious issues. In fact, I believe anyone researching this case will find a practical framework for grasping the issues, responses, and decisions in this case by referring back to Ms. Williams’ list of seven key legal concepts. I have copied it below, leaving out the case citations. This list is found in defendants’ Memo in Support of Special Motions to Strike – i.e., the reasoning behind the filing of an anti-SLAPP motion – on Page 26, Point G. The table of contents in that same document is also exceptionally well laid out to help us follow a logical line of reasoning. Statements expressed on the internet, especially on publicly accessed websites and interactive platforms, enjoy free speech and free exercise of religion protections of the First Amendment and Oregon Constitution. Only statements which are provable false are actionable as defamation. A court must evaluate alleged “defamatory” meaning in the “full context” of remarks. Opinions based on stated or known facts are protected (regardless of whether others would reach different opinions reviewing those same facts). Rhetorical devices, such as irony, hyperbole and figurative language, are cues that statements are opinion. Given the nature of the legal process, it is understandable that the plaintiffs’ first two Complaint documents contained no citations of case law precedents or relevant sections of the Oregon State Constitution. While they might have put citations into these documents, they really only had a need to do so in their response of Opposition to Motion to Strike (13 pages). In that third major document, the plaintiffs referenced four legal cases and one Oregon statute. (Two of the four legal cases were also cited by the defendants.) The plaintiffs also cited “ORCP 18A,” which had no other identifying data or explanation of the acronym and which I finally located on the internet to be an acronym for “Oregon Rules of Civil Procedure.” I was surprised at the low number of case citations by the plaintiffs – this was their best opportunity to clearly develop a reasoned presentation of their case. It seemed to me they missed out. That very low number of cases cited to support their opposition to the anti-SLAPP motion stands in stark contrast to Ms. Williams’ rather monumental Memo in Support of Special Motions to Strike (54 pages). Her document refers to 70 cases, two Oregon statutes, and six other references – mostly legal resources. Also, she alphabetized all referenced items within their category sections and she indexed all entries to the page numbers on which they could be found. Her Memo in Support of Special Motions to Strike regarding Amended Complaint (24 pages) included 13 cases in the “Table of Authorities.” Of these, eight cases cited were also used in the original Memo to Strike and five cases were new. When we read the Order on Motion to Dismiss from Judge Fun, it is clear that he recognized the logical and legal case presented by Ms. Williams, and that he acted in the very ways she so persuasively argued were required of the court. All throughout Judge Fun’s written reasons for his decision, he refers to principles we find in Ms. Williams’ Point G, Summary of Law. He demonstrates in his language that he accepted the premises of the anti-SLAPP law: The burden of substantial evidence was with the plaintiffs. And yet, as the next section explores, the plaintiffs’ own presentations seem to have created most of the problems they experienced in attempts to persuade the court to find in their favor. The documents that the plaintiffs filed seemed poorly prepared and unclearly written. They did not consider the possibility that the discovery process might be halted by an anti-SLAPP motion. Other actions and/or attitudes ultimately ended up bringing the plaintiffs a higher final bill in tallying court costs and attorneys’ fees for the prevailing parties – the defendants. This section looks at some aspects of those problems. This exploration should help set the stage for how the court dates and decision-making played out. I thought about the best way to approach this. I decided it would be to let Ms. Williams speak to the general point through quotes from her Motion and Memorandum in Support of Awards of Stated Costs, Disbursements and Attorney Fees of Filed by Julie Anne Smith, Hannah Smith and Meaghan Varela (filed August 20, 2012). Then, I give some specific examples that I’ve drawn from the plaintiffs Opposition to Motion to Strike. Here are examples drawn from all three defendants represented by Ms. Williams. These quotations from her “Motion and Memorandum in Support of Awards …” document mostly represent a combination of the three problems in documentation and presentation listed at the top of this section. […] All of the 17 claims against Julie Anne Smith and the 4 against Meaghan Varela were based on isolated words and phrases, and all lacked any context or explanation through properly plead innuendo, thus failed to conform to Oregon pleading rules [ORCP 18], indicating a lack of careful consideration prior to filing suit for $500,000. The single claim against Hannah Smith was not well-taken. It is very unlikely many Oregon attorneys would have thought it reasonable to include this young woman in a suit for $500,000 in damages for her single online comment that the Plaintiffs’ were “no-way Biblical.” It is even more unlikely anyone would repeat the same allegation in the Amended Complaint after its weakness should have become evident from the discussion in the Smiths’ motions filed on April 27, 2012. Time attributable to ascertaining facts and drafting argument relating only to the claim against Hannah Smith is specifically shown as 5.1 hours (drafting the arguments on the term “bully” and hyperbole and sarcasm specific to the claim against her and arranging for her waiver of service), but in general, a modest portion of the effort on every memoranda and the oral arguments is both necessary and attributable to defending this frivolous claim against Hannah. As in most defamation cases, context matters a great deal and requires explication for the court to perform its role of evaluation speech in full context. … Plaintiffs offered no meaningful context for the allegedly defamatory snippets offered. In this case the necessary context provided and discussed by Defendants included the timeline of the church-related disputes (going back about 18 years in the case of Defendant Varela), the broader context of shunning practices in very traditional Calvinist denominations, the theological context for use of certain Scriptural phrases, and full and complete renderings of the complained-of blog and internet statements in their complete context. Context also included case law evaluating online statements and how such statements are perceived by that audience. Plaintiffs claimed $500,000 in damages. Even if only a few of the claims remained, the potential liability (and continued litigation costs) would have been financially ruinous for Defendants. It was incumbent upon Defense Counsel to mount a full and complete defense against every allegation of defamation. Plaintiffs are the parties who chose to plead the large number of claims for defamation. Here is my own statement of the essential point: The plaintiffs were fully responsible for filing the lawsuit, and the entire way in which it was structured, reasoned, written, and presented. It does not appear to have in any way anticipated the possibility of an anti-SLAPP motion, or else it would have been composed quite differently. But, once the anti-SLAPP measure was in force, they were basically “stuck” with what consequences of the choices they’d already made. The two-pronged test for defamation. Actionable and non-actionable types of speech for defamation. The case of Beaverton Grace Bible Church v. Smith was assigned to Judge Jim L. Fun, of the Twentieth Judicial District, Circuit Court of Oregon. His considerations included court appearances by the parties and their legal representatives on May 21 and July 13, 2012. They also involved the following documents, totaling 109 pages, plus many other motions and written declarations. The plaintiffs’ original complaint (8 pages) and amended complaint (10 pages). The defendants’ anti-SLAPP/motion to strike (54 pages) and memo regarding amended complaint (24 pages). The hearing was moved later than scheduled and lasted about 2 hours. Our attorneys were very well prepared and were simply amazing. The plaintiffs’ attorney told the court they were dismissing one of the defendants from the lawsuit and also some of my phrases (we still need to see the court documents). These developments are positive. The judge asked the attorneys to write up a “summary”, no longer than 5 pages each due by a specific date and then the next (and hopefully final) hearing will be July 13. My attorney just sent me an e-mail: this blog has over 100,000 hits. Yup, I guess this blog is of public interest. Thank you all for your support! It is understandable that Mr. Syverson was hired in this case for his expertise on internet defamation issues. It makes sense, given that all 27 allegations deal with internet issues – messages posted online with Google Reviews and DexKnows, or with blog articles and comments on Julie Anne Smith’s BGBC Survivors BlogSpot/Blogger site. After the trial was over and the plaintiffs case was dismissed, Mr. O’Neal set up what Ms. Smith calls an “impostor blog,” using a domain name that is an explicit spinoff from her blog’s title of “BGBC Survivors.” (More details on the “impostor blog” can be found on Archive page 02B Narrative Account and Analysis: “Sidebar Issues.”) Doesn’t that fit within the essence of “cybersquatting”? Read Mr. O’Neal’s blog articles and internet comments and press releases. It may not take much imagination to see the potential for role reversal, where Mr. Syverson could be putting together a case against Mr. O’Neal, instead of working for him. As it was, in his role as a counsel for the plaintiffs, he had to work with the situation given to him – one of an apparently poorly constructed case that was effectively frozen in place by the anti-SLAPP motion. Judge Fun issued his decision in Order on Motion to Dismiss on July 23. Defendants began receiving the news from their lawyers on July 26. A ruling in favor of the defendants’ Motions to Strike (i.e., anti-SLAPP motions). This also involved the dismissal of all 27 defamation claims against the defendants. Here are a few details and excerpts that demonstrate the Judge’s own legal reasoning behind his decisions in the first issue, plus expand on the legal process for the second issue of court-mandated payments. 1. A ruling in favor of the defendants’ Motions to Strike (i.e., anti-SLAPP motions). This also involved the dismissal of all 27 defamation claims against the defendants. These quotes show that Judge Fun basically agreed with what Ms. Williams had outlined in her court documents as the relevant case law governing such a defamation lawsuit as this, especially one with religious issues that further bring it into the realm of freedom of speech and First Amendment Rights issues. In referring to the guiding precepts that were already in U.S. and Oregon law, Judge Fun made it very clear that the core of his ruling was that the plaintiffs failed to make their case. The court costs and attorney’s fees for Jason and Kathy Stephens had already been submitted. These totaled $16,750. These defendants declined the option of reducing their fees. The judge invited the remaining three defendants – Julie Anne Smith, Hannah Smith, and Meaghan Varela – to submit statements for their court costs and attorney fees, which the plaintiffs were also ordered to pay. Judge Fun’s decision reveals some significant legal opinion on why the defendants’ reasoning won and the plaintiffs’ reasoning failed. Yet, in the aftermath of this case, people are trying to nuance how they present the results. Their terminology depends on whether they are pro-plaintiff or pro-defendants. Regardless of such attempts by people who want to make the dismissal sound the way they want, the above words of Judge Jim L. Fun himself speak for themselves. My summary is this: The plaintiffs failed to provide the required substantial evidence of provable facts for defamatory statements. The court authority responsible to preside over this case and to write the legal decision on the matter makes this point abundantly clear – regardless of how people want to wrangle over the exact wording to use in summarizing the truth of what happened. As the old saying goes, “It ain’t over til it’s over.” Just because Judge Fun ruled in July to grant the defendants’ anti-SLAPP motion and dismiss the plaintiffs’ case, that did not bring closure to the lawsuit. The legal process includes a number of additional post-ruling elements and events. Several deal with payment of the prevailing parties’ court costs and attorneys’ fees. Some deal with the judge’s signing of the “final decree” and deadlines. Some of the last details stretched into six full months after the final court date. This section addresses those aftermath actions and issues. Statements of court costs and attorneys’ fees for the remaining three defendants – Julie Anne Smith, Hannah Smith, and Meaghan Varela – were submitted to Judge Fun by their attorney, Linda Williams. Such statements typically include various supporting documentation and information, such as the attorneys’ detailed time records, resumes, fees awarded in other cases, etc. The “Motion and Memorandum in Support of Awards of Stated Costs, Disbursements and Attorney Fees of Filed by Julie Anne Smith, Hannah Smith and Meaghan Varela” was 26 pages long. There were separate additional statements detailing hours and costs for the Smiths (4 pages) and Ms. Varela (4 pages). The amount totaled nearly $44,375 ($2,768.52 in court costs and $41,604 in attorneys’ fees). If these amounts were not contested and stood at that level, that would have brought the payments for all five defendants’ fees to over $60,000 ($16,750 for the Stephens + $44,375 for the Smiths and Varela). Other costs, the attorney’s hours spent, and/or the attorney’s hourly rate, could be contested. If the losing parties had decided to contest any part of the statement, then the normal procedure would include two steps. First, the prevailing parties would reply to the details of what has been contested, and second, once they had, then the court would set a hearing on the amounts. The judge would determine what he/she deems “reasonable” from these hearings, and put those amounts into the final decree. In Beaverton Grace Bible Church v. Smith, however, the plaintiffs declined the opportunity to contest any aspects of the statements submitted. They did not file any objections, including to the individual prevailing party fee request. So that part of the aftermath was completed. Typically, the losing parties in such cases contest some aspect of the amount submitted for payment as attorneys’ fees. They can challenge whether the per-hour rate is “reasonable,” and whether the number of hours spent on a specific activity is “reasonable.” So, the lawyers who submit the statements need to lay out why they charge the rate they do, given their expertise, years of experience, the complexity of the case, and/or unusual circumstances. They must also justify the amount of time spent on specific activities. Julie Anne Smith had the most allegations to refute – 17 of them – and each one had to be addressed. Leaving any out could still have made her liable for the full lawsuit amount, if the anti-SLAPP motion failed. Hannah Smith had only one allegation, based on one brief statement she’d made, and yet the general details of her case required as much response as the other two defendants being represented. Meaghan Varela was added to the Amended Complaint (filed April 26, 2012) as a defendant, and was only served with legal papers shortly after that. Preparation of her case required more urgency to complete, as Judge Fun was due to be rotated into another area of the Oregon Circuit Court starting August 1. So, if the case were not presented by then, it could cause additional concerns. On December 4, Judge Jim L. Fun signed and “officially entered” the final judgment Decree to (1) grant the anti-SLAPP motion and dismiss the lawsuit, and (2) award court costs and attorneys’ fees for the remaining three defendants. The plaintiffs had 30 days from this decree date (i.e., on or before January 3, 2013) to file an appeal on the final amount awarded for court costs and attorneys’ fees. Appeal the judge’s final decree regarding the award to pay the final three prevailing parties for their court costs and legal fees. If they appealed, Judge Fun’s judgment on the award was still enforceable after this deadline date. So, if the plaintiffs chose to appeal the decree, they would be required to post a bond guaranteeing payment with interest if they were to lose their appeal. Not appeal the decree. If this was their choice, they would be required to pay the judgment award. Failure to pay would mean facing debt collection actions – including accrued interest from the date of the judge’s final decree (December 4, 2012). No appeal or payment was received by the defendants’ attorney for nearly a week after the January 3, 2013, deadline. So, on January 9, Ms. Williams issued “10-Day Notice and Demand” letters requiring payment. They were sent by mail with return receipt. These were sent to Charles O’Neal as an individual judgment debtor in the case; and to Barbara Gilgan and Dale Weaver, two individuals listed as officers for Beaverton Grace Bible Church on their Corporation Division website as an Oregon non-profit debtor. Because Mr. O’Neal and BGBC filed as co-plaintiffs in the lawsuit, and they lost their case, both were liable for the entire judgment award. This meant that if one was not able to pay anything, the other was responsible to pay the whole amount. Therefore, it was necessary to ensure that all debtor parties received notice that the award payment was overdue. So, On January 17, 2013, Ms. Williams sent a process server to deliver the letter in person to Mr. O’Neal. However, on January 19, she received checks from Beaverton Grace Bible Church covering the full amounts due for court costs and attorneys’ fees for the final three defendants – Julie Anne Smith, Hannah Smith, and Meaghan Varela. Each check also included 46 days of interest, accrued from the date of the judgment (December 4, 2012). Since the judgment award was now paid in full, serving the notice on Mr. O’Neal was no longer necessary, and the process server was withdrawn. As the court-mandated payments were received on the 10th day and final day after the “10-Day Notice and Demand” letters were sent, this ended the dealings with the aftermath of Judge Fun’s decision on Beaverton Grace Bible Church v. Smith. Bloggers in the “spiritual abuse survivors community” tended to post articles periodically throughout the entire period of the trial, but mostly from May through August, often with analysis pieces. There were two clear “spikes” in news media interest about Beaverton Grace Bible Church v. Smith. The first was May 14-21, when a news report on the then-forthcoming first court date broken and went viral and global within two days. The second was July 13-26, from the time of the second court date and the judge’s deliberations until immediately after new of the decision for dismissal began circulating.